Breadfruit is a fruit which is very popular across the South Pacific. Breadfruit is found in Hawaii and various places in the Caribbean. Breadfruit belongs to the mulberry family and resembles mulberry fruits but are slightly larger in size. The breadfruit tree is regal looking and has dark green leaves which can reach heights of approximately eighty-five feet. The fruits appear at the tips of the branches in groups of three or less. When breadfruit is ripening, it starts out green and then turns to a rich brown or lavender in colour. There are over 200 known varieties of breadfruit varying in sizes, flavours and colours. Breadfruit is versatile and can be eaten green or ripe. In the ripe stage, it can be eaten raw and in the green stage, it must be cooked. Green breadfruit has a white, starchy center and is firm to the touch. Ripe breadfruit has a creamy to yellow flesh, slightly pasty in texture, and is sweet to the taste. Breadfruit has been cultivated for centuries by people in the South Pacific but did not gain popularity until about the 18th century when Western explorers became intrigued by this plant. Breadfruit flour is an excellent substitute for wheat flour in making bread. Breads made from this flour are more nutritious because the flour is much richer in lysine which is one of many amino acids. Lysine helps to treat cold sores and aids in maintaining a healthy immune system. 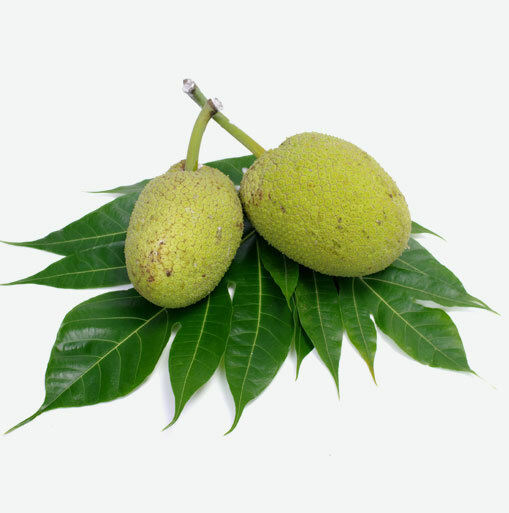 Breadfruit is high in dietary fiber and helps to promote regularity. If using ripened breadfruit, you should look for a slightly soft fruit with an even colour and small globules of latex on the surface. Unripe varieties should be firm and evenly green. In both cases, the fruit should be used within a day of purchasing as it is perishable and does not handle refrigeration well. Keep breadfruit in a thick bag to prevent any cold damage. Breadfruit can be used like a potato or winter squash; it can be baked, boiled, fried, or roasted. Some cooks soak it in water overnight before peeling it. Baked or roasted, breadfruit is good with butter, salt and pepper. When baked, breadfruit yields a texture and flavour that is very similar to conventional whole wheat bread. Unripe fruit can also be used to make a flour or paste, which can be used successfully in baking. Breadfruit is also used to make puddings and candied to create snacks. In addition, it provides animal fodder in some parts of the world.